Milli Gazete columnist Zeki Ceyhan writes on Turkey's economy policy. Here is the full article. 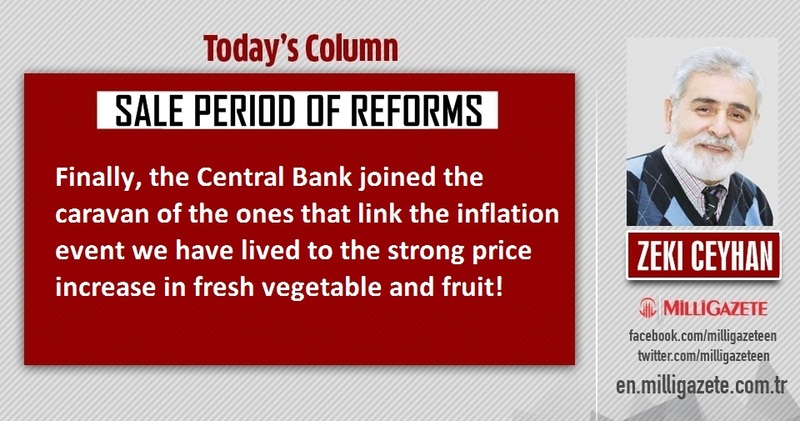 Finally, the Central Bank joined the caravan of the ones that link the inflation event we have lived to “the strong price increase in fresh vegetable and fruit”! So, they all became an innocent aubergine guilty! The spokespersons of power declare that they will “adjust” the price of vegetables and fruits by indicating they can’t(! )be just an onlooker to this situation. The price of vegetables and fruits had already deserved to be adjusted a long time ago. Those who decided to make adjustments are considered to be late. As we were thinking “how this adjustment will happen?” the spokespersons of power came to our rescue. They expressed by saying “you know, there were regulated sales once” that municipalities have important duties about that. As you can understand, municipalities will start to make regulated sale for keeping the price of vegetables and fruits under control. The pro-media started to talk about the formings like “folk vegetable” and “folk fruit” as transplanting this situation to its readers. Apparently, they must have been affected by “folk bread”. For the reason that they couldn’t become stabilized in prices with “Meat and Milk Institution”, maybe they will present “folk meat”. If that formula is implemented from now on, the other folk buffet can be put into service beside the folk greengrocer in street crosses. Or the folk bread buffets can be developed a little more and can be combined with folk greengrocer. We have never gotten along well with the ruling party but after all they are our old allies, friends! We don’t withold our help from them. Since they remember the terms of regulated sale, let us make a small reminder. For instance; the bread was depended on card in this country once. If the price of fresh vegetable and fruit are depended on card, will not the strong price increases be prevented? The spokespersons of power are declaring with the statements they express what will they do in the forthcoming week. So, they aren’t talking about what they are doing today! Anyway, what they are doing today doesn’t make any sense except from watching the raises. When they are planning to adjust the price of vegetables and fruits, doesn’t the price of vegetables and fruits seem to set them?